There is a general myth that black shoes don’t work with Navy suits but let me burst that myth today. Black shoes go very well with dark navy or midnight navy suits. 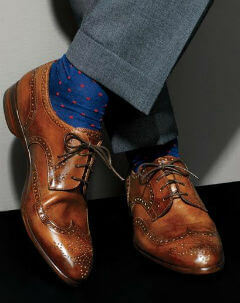 But once you venture into lighter shades of navy that is when you need to opt for brown pair of shoes. So a general rule of thumb to follow here would be lighter the shade of navy the lighter the shade of brown shoes. When it comes to picking a shoe colour with Charcoal suit, I have to say the choices are quiet limited and as charcoal suit is the most less forgiving. With charcoal suit your best option is to go black shoes. Grey suits can offer you a bit of freedom when it comes to picking of shoes, you can pick your shoes based on the mood and formality of the occasion. Light grey suits work with light brown shoes, the darker the grey the darker the brown of the shoes needs to be. However medium grey suits also ca be worn with black shoes. Brown suits are usually worn with brown shoes but that does not mean that you go all matchy-matchy! When picking your brown shoes with brown suit always make sure there is enough contrast between the two. 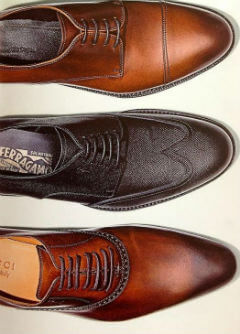 The general trend is to pick a few shades darker shoes than your brown suit. Whatever suit colour you pick our suggestion is to have it tailored right. Whether it is a Wedding suit or a business suit, it is important that it is tailor made and fits you perfectly.